Plug in your guitar/bass into the amPhones and start playing! New concept - headphones with built-in amPlug technology that allows you to obtain full-fledged guitar/bass sounds immediately. Totally analog design that faithfully simulates the circuit response of the original amp . The "AC30" version which faithfully reproduces the classic VOX AC30. The "Twin" version which gives you the clean sound of a classic US-made amp. The "Lead" version which delivers a heavy British crunch lead sound. The "Bass" version which provides a wide-range sound, including a new Bassilator circuit that realistically simulates the resonance of the speaker cabinet and floor. amPhones come in four models: the "AC30" faithfully reproduces the sound of the classic VOX AC30 amplifier, the "Twin" simulates the sound of a famous US-made clean combo amp, the "Lead" covers lead guitar sounds ranging from UK-made amps to US-made high-gain boutique amps, and the "Bass" models VOX's classic AC100 bass amp with a wide-range design to meet the needs of today’s modern electric bass players. Each uses a completely analog design in order to faithfully model the circuit response of the original amp, and will satisfy even the most critical listener. The amPhones series contains numerous effects that add variety to the sound. The "AC30," "Twin," and "Lead" provide reverb/chorus/delay, and "Bass" provides a compressor. 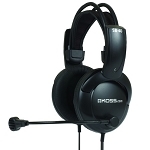 Each effect is adjustable, giving you sound with superb presence that will bring out your best performances. 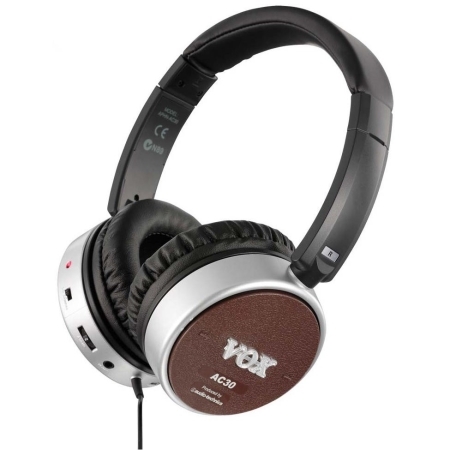 When you disconnect your guitar/bass and power-off your amPhones, they will function as a conventional set of headphones that offer the superb sound quality that you would expect from VOX. 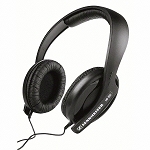 The headphones themselves are made by Audio-Technica, the name you trust in headphones. You'll enjoy optimum sound quality and a comfortable fit that will not produce listener fatigue, even during extended listening sessions. 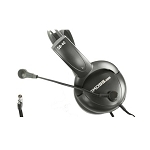 Their folding design allows easy portability, and the extension cable and adaptor plug are also included, making these units an excellent choice for their stand-alone headphone functionality. 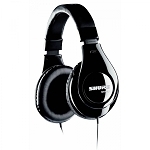 More and more these days, headphones are used by many music lovers as a “must have” accessory and fashion statement. Introducing the iconic Vox brand into this segment will allow Vox to be “seen and heard” in mainstream consumer markets as well as existing music industry channels. *Audio-Technica is registered trademarks of Audio-Technica Corporation.